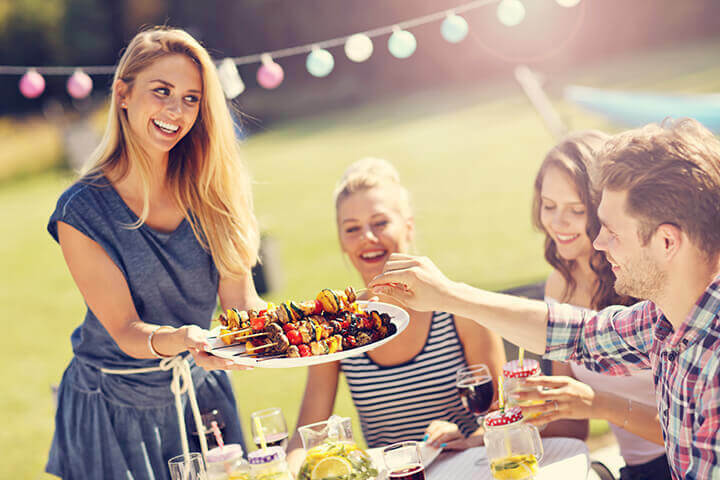 It’s only natural for a new homeowner to want to invite friends and family over for a summer get-together at their new home. It’s wise, however, to think about how entertaining will impact the neighborhood. The last thing that a newbie to the community wants is to upset neighbors because they were inconvenienced, or disturbed, by the gathering. It’s a bad way to start out, and will only lead to problems down the road. 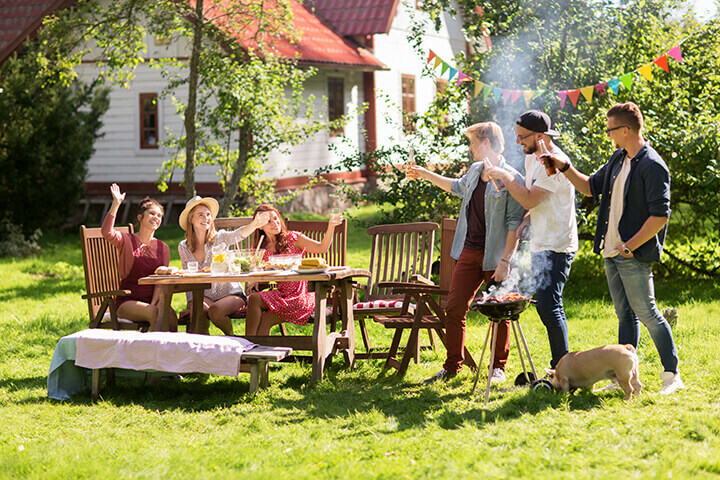 To avoid problems, and establish themselves as the polite newcomer to the neighborhood, and a responsible homeowner, there are a few things new homeowners need to keep in mind before planning a big get-together at their new house. Summertime is spectacular, and spending those beautiful days with friends and family only makes it better. Making sure that a get-together doesn’t cause trouble between with the new neighbors is imperative. Now is the time to make a good impression, to begin building a peaceful, kind relationship with these people that will last many years. Starting out on the right foot means treating the neighbors with respect. It doesn’t take any special effort to be polite, considerate and thoughtful. In some areas, the homes are particularly close to one another, and it might be a wise idea to let the neighbors know about your gathering. Of course, if you’re only inviting a couple of people, that might not be necessary. If the party is going to be a big one, letting your neighbors know, and even inviting them over, will go a long way towards keeping the peace. Offer a general timeframe for the event and let them know who to talk to if there are any issues. Reassure them that if anything comes up, the problem will be solved immediately. Although it might sound great to invite 50 people over to hang out for the afternoon, it might not be the best idea. Keep in mind the amount of space available in the yard, as well as inside the home. It’s best to keep gatherings smaller so that there’s enough room for people to move around and mingle. Some families are just too big for the backyard. Rather than trying to fit everyone in at the same time, make it a monthly event that includes different numbers, or groups, of people each time. Before the big day, it’s essential to prepare the yard and outdoor entertainment areas. Rake any sticks and other yard debris from the grassy areas and anywhere guests might walk around. Sweep the deck or patio, and give it a good cleaning with some appropriate soap and water applied with a scrub brush, pressure washer, or wide broom. Give the patio furniture, grill, and prep areas the same kind of attention. Mow the lawn, pull the weeds and plant a few flowers to make the scene look inviting. Scheduling a get-together too early in the day means some people won’t be able to make it. Plus, the host and anyone helping with preparations will also have to get up early to get things ready. Likewise, an evening soiree won’t appeal to some of them, and a long day of prepping will leave everyone exhausted. Somewhere in the middle of the afternoon might be the sweet spot. It allows the time to take care of last-minute cooking and prep work, and maybe even a little quiet time to mentally prepare for the event. Since it’s still early in the day, it won’t be a huge bother to the neighbors while it’s going on. Guest parking might become an issue, especially in a city. There may only be a small number of parking places available, and too many cars will create congestion and annoy the neighbors who usually park there. One way to overcome this problem is to locate a public parking facility close by, and shuttle guests to the party and back. Parking vehicles in the yard is a good option in a rural setting, providing it isn’t wet, sandy, or otherwise unsuitable. Without adequate, comfortable seating for guests, a backyard barbecue isn’t going to last too long. One option is to ask people to bring their own chairs along so they have a place to sit. It will still be necessary to provide tables to prepare, serve and eat food. The easiest way to remedy the situation is to rent tables and chairs for the day. Many rental companies also offer pop-up shade canopies and other equipment like grills, lights, and even sound systems. The best part is that they’ll often deliver everything, and pick it all up after the party. When larger groups of people get together, things can get a little loud, especially if there is music playing. Be a considerate neighbor and keep the volume down to a moderate level. Remember that sound carries, so encourage guests to keep their voices down, so they don’t disturb the neighbors. If kids are running around, keep the screeching to a minimum. Above all, don’t let a dog bark continually; whether you’re having a get-together or not, it’s a sure way to upset the neighbors. Even for people who love to cook, a large meal for several people is a huge task to undertake by alone. The best thing to do is to start a couple of days ahead of time to avoid becoming overwhelmed and stressed out on the big day. Alternatively, ask everyone to bring a covered dish to pass, and supply only the main meat course. That way, the guests can show off their culinary talents, and you everyone gets to sample a variety of dishes. Either way, keep the menu basic and serve the foods that are most popular among the group invited. There is almost always food left over after a large family meal, and the host probably doesn’t want to keep all of it. Of course, those who bring a dish to pass can take their items home, but sharing is also great. To make it more convenient, consider providing lidded plastic containers for guests to take away. If there’s a substantial amount of food left, consider donating it to a local agency. That way, no one ends up getting stuck with more than they need or want. Plus, it helps to limit or eliminate waste. For many people, a cold beer goes perfectly with a grilled burger and fresh potato salad. However, having too many adult beverages could lead to rowdiness and noise. While it’s perfectly legal for an adult to enjoy their favorite beer on a hot summer day, it’s important to keep things under control. If a homeowner allows heavy drinking at their gathering, and a problem arises, they can be held legally responsible. Provide water, and other non-alcoholic beverages and encourage guests to stay or get a designated driver if they have been drinking. A sudden thunderstorm, heavy rain, or gusts of wind could send everyone scrambling for cover in the middle of a perfectly cooked outdoor meal. No one can control the weather, but they can certainly plan for it. If there’s even a small chance of rain, consider providing indoor accommodations for guests. For example, pull the car out of the garage, and set up some tables and chairs inside. When renting a canopy or another outdoor shelter, make sure it gets adequately secured and has protective panels to keep out the rain. Keeping the outdoor entertainment area clean is incredibly important. Provide ample trash cans for guest’s paper plates, cups, and plastic cutlery. Walk around, visit with the guests and pick up and throw away any discarded trash. As soon as the party is over, stack the chairs, fold up the tables, dismantle the canopy and clean the area. Don’t let it sit until morning. The neighbors will appreciate it, and it keeps that new home and yard looking great. Buying a home for the first time is a thrilling experience, and it’s perfectly understandable to want to share it with everyone. An outdoor gathering is a perfect way to do it, and it’s a lot of fun as well. If things don’t get handled properly, however, it can cause a rift in the neighborhood. It doesn’t take a significant amount of effort to be a considerate, thoughtful neighbor. Communicate the plans, and let the neighbors know they’re welcome to stop by. During the party, pay close attention to the way guests behave and keep everything clean and orderly.